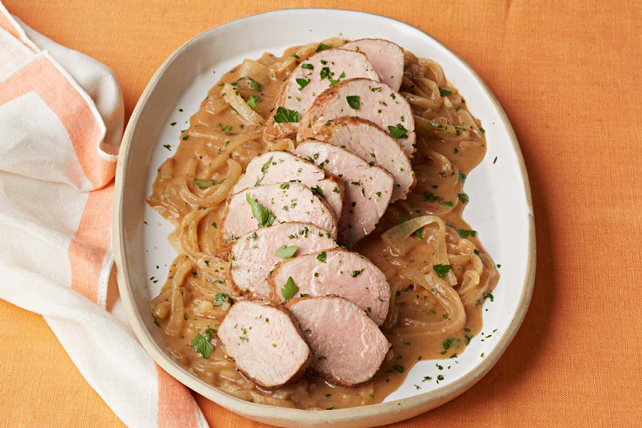 Pork au Poivre with Vidalia Onions - don't let the fancy name fool you! Pork tenderloin doesn't get any tastier or easier than this. Sprinkle meat with pepper; press gently into meat to secure. Cook in large nonstick skillet on medium-high heat 6 to 7 min. or until evenly browned, turning occasionally. Transfer meat to rimmed baking sheet sprayed with cooking spray. Bake 16 to 18 min. or until done (160ºF). Meanwhile, melt 1 Tbsp. butter in same skillet on medium-low heat. Add onions; cook 10 min. or until tender, stirring occasionally. Add broth, dressing and mustard; mix well. Simmer 8 min. or until slightly thickened, stirring occasionally. Remove from heat. Add remaining butter; stir until melted. Sprinkle meat with parsley; cut into thin slices. Serve topped with sauce. Fold narrow end of uncooked pork tenderloin under meat, then tie with butcher's twine to secure. Bake as directed. Cut twine off cooked meat before serving. For a lighter-coloured sauce, prepare using 25%-less-sodium chicken broth.